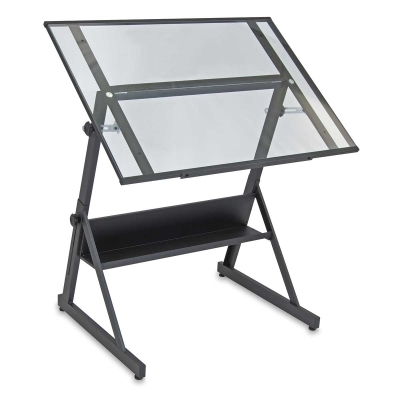 The Studio Designs Solano Drafting Table is possibly the coolest drafting table we've seen. Don't be fooled by its simple design — the triangular shape keeps it rock steady, and the tilt angle goes from flat to an almost perfectly vertical 85°. Solid stainless steel construction lends it a raw, industrial look, and the clear glass top reveals its entire structure. This table is practically a work of art in itself. Four floor levelers are included should your floors be less than perfectly even. A lower shelf is handy for holding books and go-to supplies. The Solano Table measures 42"W × 29"D. The height is adjustable from 30" to 40½".